It’s a quiet afternoon in Nazaar Hussein Shah’s Bollywood DVD store in the heart of Athens’ South Asian immigrant community. Taking a breather, Shah looks relaxed as he recalls times not so long ago when life was harder and more frightening. “Before, when Golden Dawn would come and cause trouble, we would get scared,” said Shah, who has been a legal resident of Greece since 1991. “We would close up our shops and hide. Shah is a member of Greece’s Pakistani immigrant community, one of the main targets for alleged race crimes by the country’s Golden Dawn far right political party, who have been accused of spreading racial hatred across the country since a surge in popularity in 2012. Now, a landmark trial of 69 Golden Dawn members — in which its elected politicians are accused of being part of a criminal gang — is providing immigrants with hope they may once again feel welcome in Greece. All 18 former and current Golden Dawn MPs, including the party’s leader, Nikos Michaloliakos, are among those accused of a string of charges linked to the murder of anti-racist rapper Pavlos Fyssas in September 2013. The openly xenophobic and homophobic group are said to have used the guise of political legitimacy to pursue a campaign of terror against Greece’s immigrant community, who they blame for the country’s economic woes. A fringe party for many years, Golden Dawn gained a dramatic increase in support during Greece’s 2012 parliamentary elections, at the height of the country’s financial crisis, winning 18 seats to become the country’s third most powerful party. Prosecutors say their attacks on dark-skinned immigrants, gay people, and political opponents then spiraled. With a case file that runs to over 30,000 pages and huge media interest, the trial is being described as the biggest in Greece in decades, and a defining moment for the country. After the first hearing on April 20, the case was adjourned twice, and is due to restart on May 12. Protests and skirmishes outside the court in the poor neighborhood of Korydallos have become a characteristic of the hearing dates. Thanassis Kampagiannis, a lawyer currently representing two Egyptian clients at the Golden Dawn trial, told VICE News that Greece’s Pakistani community — estimated to number about 80,000, more than half of whom are undocumented — was persecuted more than any other minority group. 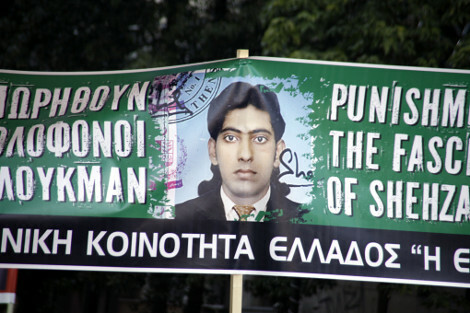 “Golden Dawn’s racist attacks were more and more against Pakistanis, Afghans, and Bangladeshis,” said Kampagiannis, who was part of the legal team that successfully prosecuted two men linked to Golden Dawn for the murder of Pakistani worker Shehzad Luqman in 2013. “The Pakistani community is one of the largest of these communities, which is why they have suffered more racist attacks.” he said, adding this had been fueled by rising Islamophobic rhetoric in Greece and beyond. Pakistani immigrant Muhammad Shaqeel is soft spoken. But when he starts talking about life with Golden Dawn, a tirade of complaints comes out. “Things have not been good here,” Shaqeel told VICE News. “We are a peace-loving community, we come here to work hard,” he said. Kasim, not his real name, is a waiter at the restaurant. He has been in Athens illegally for three years. He’s more laidback, speaking with his arms casually folded as he watches the customers. Dimitris Christopoulos, vice-president of the International Federation for Human Rights, said what set Golden Dawn apart from other far right groups — currently surging in popularity in several parts of Europe — is that instead of having links with criminal gangs, as is common among neo-fascist parties, Golden Dawn had its criminality embedded within it. Golden Dawn are said to enjoy strong support from Greece’s police force, with one analysis of votes cast in the last election claiming that more than 50 percent of officers had voted for the party. It’s claimed they have let the far right group carry out attacks with impunity. 12/05/2015 in International, Δίκη Χρυσής Αυγής, Δολοφονία Σαχζάτ Λουκμάν, Μετανάστες/Πρόσφυγες, ΜΜΕ.